There are many sources of media that you might use in Moodle and there are also multiple ways of adding them. This guide focuses on how to add video from Youtube. For other video sources and methods to deploy them in Moodle see Using images and media in teaching. Locate the video you require on Youtube. One option is to copy the link (URL) at the top of the page (or from the Share link) and Add a URL (web link) to Moodle. However, there is a better alternative. Click Share and select Embed. 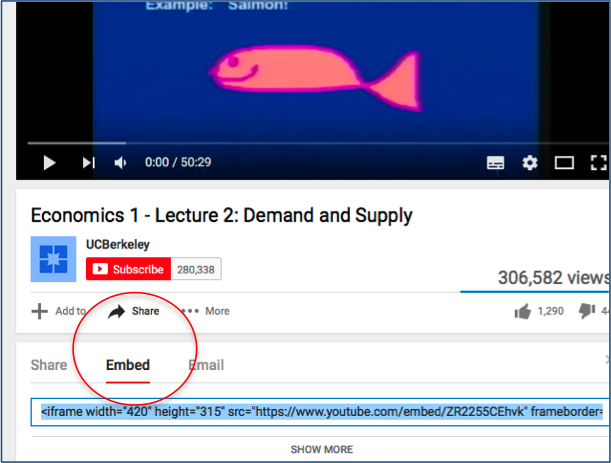 Right click and Copy the embed code which should be already selected in the box. (If it is not selected, click and drag or use Ctrl + A to select it). 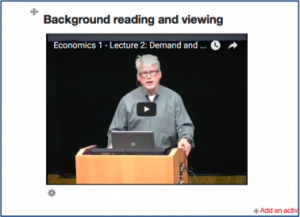 Open the Moodle course to which you want to add the video and Turn editing on. Select a location for the video – usually a page and open the text editor. Click to expand the toolbar and then select the html icon. 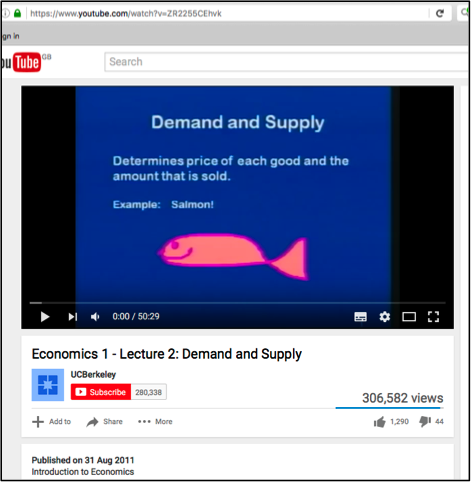 Paste (Windows: Ctrl + V or Mac: Cmd + V) the embed code copied from Youtube and Save changes. The video will then appear on your course as below. Students can play it within Moodle or on Youtube as required. To make any changes, edit the area in which the video is located and click the html icon. You can, for example, change the size of the video window by altering the height and width figures in the embed code. 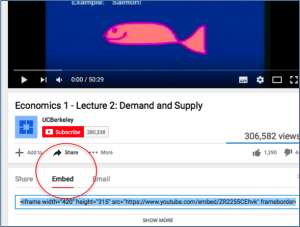 The method described above for embedding Youtube videos applies to any media with embed code.